Mammut Ambassador Todd Offenbacher--Tahoe Adventure Film Fest (TAFF) founder, Ski Guide and Television Host for Outside Television--is bringing his film festival to Jackson Hole. 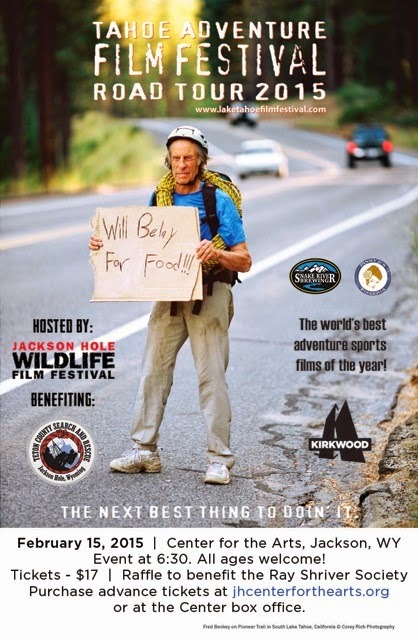 In conjunction with Teton County Search and Rescue and The Jackson Hole Wildlife Film Festival, TAFF will present ten short films from several different mountain sport genres--wing suit BASE jumping, water fall kayaking, free-solo rock climbing, high speed mountain long-boarding, and skiing, are all featured in this years festival. The TAFF is known for quality short films and for the high-paced, infectious humor of it's host--Todd Offenbacher. For 12 years running TAFF has sold out Tahoe's largest venues. Todd is excited to bring his films to Jackson, escape the California drought, and share his festival with like-minded mountain people. "We are all one tribe," screams Offenbacher. "We are not here to judge the films, but they are chosen to give a balanced look at the years' extremes in adventure sports. This is a celebration of our unique mountain culture and lifestyle. I know this festival will connect with the people of Jackson Hole." Offenbacher has dedicated his life to adventure sports, and has climbed and skied around the globe with many first ascents and descents from Pakistan to Antarctica. He has been on Eldorado Search and Rescue in California, and is currently a director at the Sierra Avalanche Center. He recognizes the importance of supporting local mountain communities and connecting them. This presentation is a fundraiser for Teton County Search and Rescue. The Tahoe Adventure Film Festival is a fast paced, high energy, refreshing look at mountain sports, lifestyle and culture. It is like no other film festival you have ever seen. Todd Offenbacher hosts the festival giving insight to the featured films, while keeping the crowd in stitches with his own sense of humor, and life lessons. Do NOT miss this one of a kind film fest. The Tahoe Adventure Film Festival Road Tour will be held at the Jackson Hole Center for the Arts on February 15th. It is the 3rd anniversary of the death of TC SAR member Ray Shriver killed in a helicopter crash while preforming a rescue. There will be a raffle to benefit the Ray Shriver Society with support from the JH Wildlife Film Festival. Doors will open at 5:30 with a reception for mingling with friends and family. Show start at 6:30 PM.